The quest for a quick and healthy lunch box dish for the kids led me to this recipe from Sanjeev Kapoor’s ‘Panner’ cookbook. 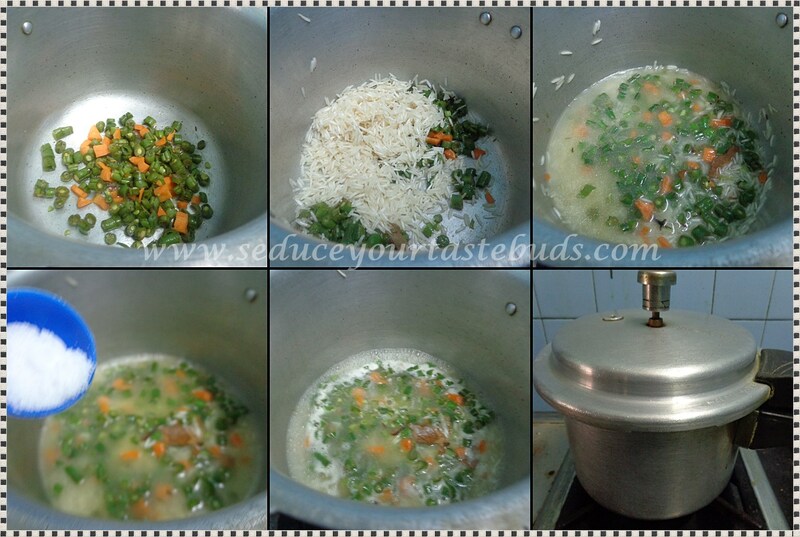 It is a simple rice preparation that is so easy to prepare especially on a hurried morning. The original recipe has just paneer cubes but I have added some vegetables to add to the nutrition and color to the dish.Since the kids are a huge fan of paneer, this was a hit. Soak the basmati rice in water for 15 minutes. Drain and keep aside. Cut the paneer into thin slabs and shallow fry on a tawa using a teaspoon of oil, till both sides are golden brown. Don’t cook too much as it will become rubbery.Chop and keep aside. Heat ghee in a pressure cooker and add the shahjeera, bayleaf, cloves and cinnamon and wait till shahjeera crackles a bit. Add the vegetables and saute for a minute. Add the drained basmati rice and saute for a minute. Add water – the quantity that you usually use to cook basmati rice, salt and let it come to a boil. Pressure cook for 8- 10 minutes or till done. Once the pressure releases naturally, add the paneer cubes, reserving a few for garnish. Gently mix in and cover and leave aside for a few minutes. Serve garnished with reserved paneer cubes, fried shallots and coriander leaves. I have shallow fried the panner as a slab instead of frying small cubes . This way is very easy and there is no need to turn each piece around to get it evenly browned. Saves time. You can use chopped onion and ginger- garlic paste after adding the whole spices. I have skipped it. Chopped cauliflower,potato, peas, etc can be added. You can add garam masala / pepper powder after adding water to add some heat to the dish. Oil can be used instead of ghee. This post joins June,Week 3, CCC #33, Cooking from Cookbook Challenge Group. Vaandu would love it.. Thanks for sharing. Bookmarking. What a yummy yummy looking paneer pulao PJ. It looks very very inviting. all ingredients I love – a great rice dish!